It is, without doubt, the single most famous synthesiser ever created. Initially issued in 1970 and manufactured until 1981, the Minimoog's influence can be felt on nearly every synthesiser that came after it. Its near-perfect combination of three voltage-controlled oscillators (one of which can be used as an LFO), 24dB low-pass resonant filter, dual envelope generators, and left-hand pitch and modulation wheels allowed gigging musicians to learn and use the basics of analogue synthesis on an instrument that was (and is) a joy to play. Cobbled together from Moog's modules and a sawed-off keyboard by engineer Bill Hemsath on his lunch breaks, the Minimoog was initially meant to be a personal, portable one-off. Yet it was perfect for musicians for whom a massive modular synthesiser was impractical. It was small, (relatively) light, and didn't require patch cables. More importantly, it sounded huge. This was an instrument that could cut through the din of a hard rock band playing at full tilt. The Minimoog was mercilessly copied by the competition, but reigned supreme thanks to an undeniable sonic signature. Nothing else sounded quite like it. 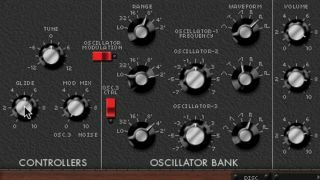 In this walkthrough, we'll show you how to emulate one of the Minimoog's most recognisable sounds - the gliding lead line. For more Moog-mimicking action, check out the full Virtual Moog Session feature in the October edition of Computer Music (CM234). Step 1: The original Minimoog made its name in the hands of progressive rockers like Rick Wakeman and the late, great Keith Emerson, both of whom exploited its wicked glide function to create swooping lead lines that weren't previously available to keyboardists. Let's create a lead of our own using GForce's Minimonsta. We'll start by loading up the CMInit patch as a jumping-off point. Step 2: Select Rect W as the Waveform for Oscillator 1. This is the second-most selection from the fully clockwise position of the Waveform rotary switch. Now, go to the Mixer section and click the blue On switch to bring Oscillator 2 into the mix. Set Oscillator 2's Range to 2'. Give Oscillator 2's Frequency knob a nudge to the right - to about +0.03. This detuning gives us a thicker sound. Step 3: Activate Oscillator 3 in the Mixer section. Set its Waveform to Square and its Range to 4'. Next, set its Frequency to -0.03. You might need to dial down each oscillator's Volume knob in the Mixer a bit. We now have all three oscillators in play. Let's turn to the Filter section, where we'll Push the Cutoff Freq knob way down to -2. Step 4: Our sound has now all but disappeared, so let's get the filter envelope (here called 'Contour') in on the action. Set the Amount of Contour knob to around 85. Now let's play with the filter envelope's shape. Kick the Attack time up to roughly 600. The Decay should be full and the Sustain set to around 6. Set Loudness Contour's Attack at min, Decay to 5 and Sustain to 6. Step 5: Note the three orange rocker switches to the left of the Filter section. The bottom two dictate how much keyboard modulation is applied to the filter. Higher notes open the filter up more than lower notes. Make sure both are activated. Have a play - our envelopes cause the sound to kick in immediately, then die down after a bit, with the filter opening and then closing. Step 6: Now for that swooping portamento so beloved of prog rockers. Before Moog, keyboardists played pianos and organs, neither of which offered a means to bend pitch. The Moog offered a pitch wheel and Glide. Turn that Glide knob up to around 12 o'clock. The combination of envelope and glide action offers a lot of expressive potential. Brilliant! We'll leave you to fetch your cape and rock out.